I started this post a couple of Monday's ago but as I didn't finish it then I left it for a while as I was determined it was going to be a Military Monday post, so finishing it on another day didn't seem right. The post was prompted by my aunt sending me my grandfather's Army Service book. I am currently hoping to apply for his full service record, but as I need her permission as his next of kin, so that's still ongoing. ﻿E L Hall was my paternal grandfather – he died what feels like a long time ago in the late 1970s. I barely knew him as we had lived over a hundred miles from him for many years. He and my father were not close – but when the news came of his death Dad drove up to Durham to sort everything out as one does. My mum recently gave me a bundle papers that Dad brought back from that trip and I sorted through them and scanned them entering the information I could glean into my family tree. I wrote a post about funeral expenses prompted by some of these papers. I still didn't know very much more about my grandad himself. I also have a few photos of him and my grandmother who died before I was born. The picture on the left is my favourite, it was taken in Ardersier in Scotland in about 1940. 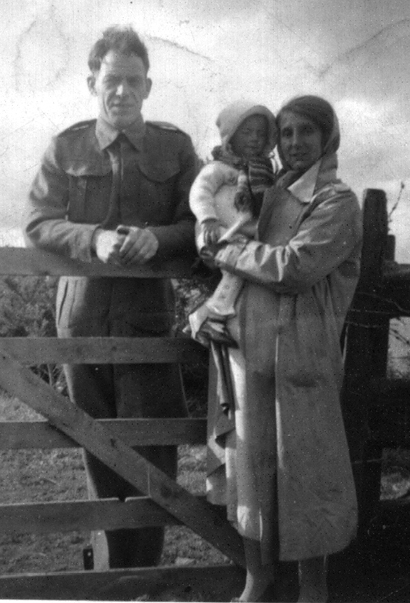 As you can see from this photo my grandad was in the army as an older man. That was because he was called up during the Second World War having previously been a regular soldier. The service book my aunt has just sent me gives the dates and places for both his periods of service. I have never seen a book like this before and it's a wonderful family document. I have very carefully scanned it and once more added the information it provides to my family tree. The book is about 4" wide and 6" tall and has a hard red cover and four leaves (making eight pages) within. The black print on the front includes a warning that, "If this certificate is lost or mislaid no duplicate can be obtained. 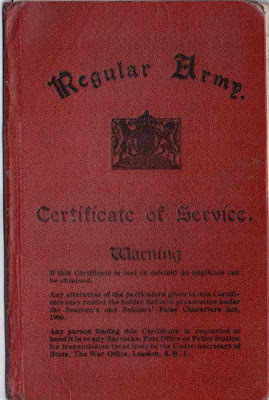 Any alteration of the particulars given in this certificate may render the holder liable to prosecution under the Seaman's and Soldier's False Characters Act 1906. 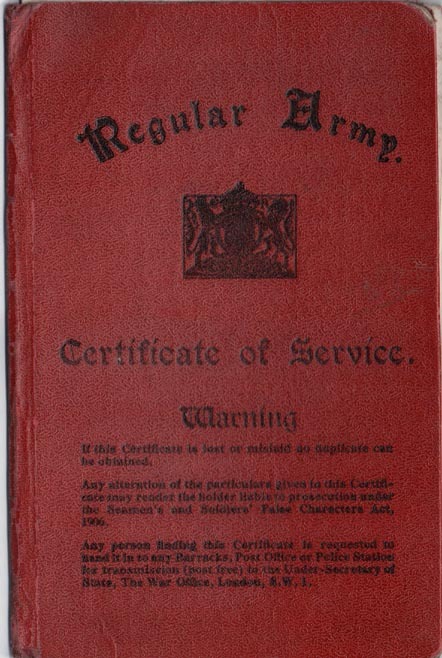 Any person finding this certificate is requested to hand it into any Barracks, Post Office or Police Station for transmission (post free) to the Under Secretary of State, the War Office, London, SW1." The book notes that my grandad first enlisted in the Seaforth Highlanders in 1925. 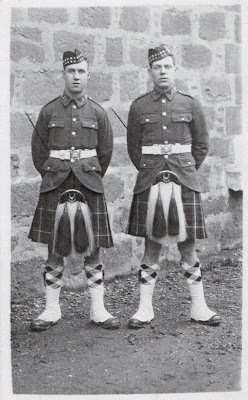 I do have a picture or two of him in a traditional kilt and one of him in a kind of linen kilt, probably taken while he was in India. The book records that he first enlisted in November 1925, he would have been 21 years old. His trade on enlistment was Miner and when he was transferred to the Reserve in 1933 he had served eight years and nineteen days. He had served in India for nearly six years and Palestine for another year. ﻿His character in 1933 was described as Good, and "a very good Storeman, sober, intelligent, clean, self reliant and handy." According to the book he was recalled to the Army on 2nd September 1939, which is the day before England declared war on Germany. He served overseas between September 1939 and June 1940 which is when our troops were evacuated from France. He then served out the remainder of the war in this country. My father remembered living in Ardersier for some time while his dad worked in nearby Fort George. As his character from his first service states he was a Storeman in the Quartermaster's Stores in 1932 to 1933 that may have been what he mainly did at Fort George between 1940 and 1944. His Service book states that for his last year and a bit of service he was in the Military Police. He served for a total of six years and thirty-five days this time, leaving the Army again in October 1945. That's about it - I can't glean much else from this little book, interesting as it is. I do hope my aunt agrees to let me apply for his full army record - I discovered on enquiring that without her permission I will only get a partial record even though he has been dead for over twenty five years, which isn't made completely clear on the .gov.uk website.